HAMMOND, La. 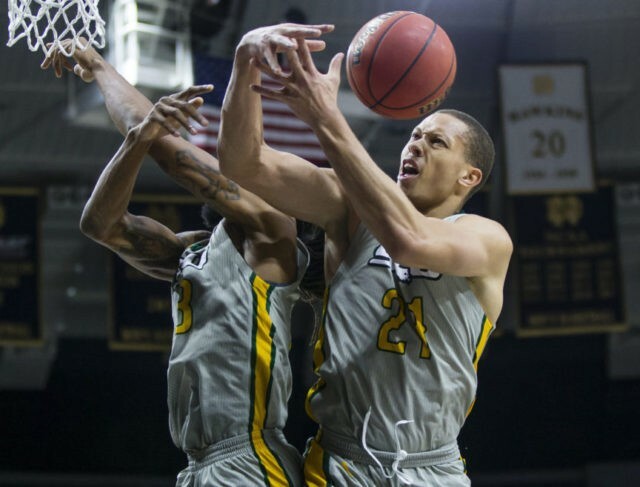 (AP) — The sight of Southeastern Louisiana starter James Currington recuperating from a bullet wound from a shootout near student housing has provided the Lions with new perspective on their program’s best basketball season in more than a decade. Regardless of how the Southland Conference’s top seed fares this postseason, the Lions can be grateful no one was killed when some of their players wound up in the midst of another episode of gun violence on a school campus a few weeks ago. “Of course, who wouldn’t be stunned to find out that one of your teammates got shot,” said junior point guard Marlain Veal, who is one of Southeastern’s top scorers, averaging 12.6 points. Southeastern (21-10, 15-3) is two victories away from its first berth in the NCAA Tournament since 2005, when now-Texas A&M coach Billy Kennedy was the one giving the Lions instructions from the sideline. Currently riding an eight-game winning streak, the Lions boarded a bus on Thursday for Katy, Texas, where they’ll open conference tournament play in the semifinals on Friday night. Currington, a senior, won’t play college basketball again. He was wounded in the shoulder during an altercation with non-students on Feb. 23, less than two weeks after a high school shooting in Parkland, Florida, killed 17 people. Currington now wears a sling as he recovers from surgery. Two men — an 18- and 19-year-old who are not students — were arrested and face multiple charges, including attempted murder. Also arrested was Southeastern player Jabbar Singleton, a senior guard, who was charged with illegal discharge of a firearm and carrying a firearm on school property. Singleton has been banned from campus pending the outcome of the investigation. The coach also defended the character of Currington, noting that he has been a good student — he was named to the conference commissioner’s honor roll last academic year — and has a son. Southeastern did not make Currington available for comment for this story. The altercation began off campus, and a police report indicates the players were followed by car back to a parking lot near the basketball arena and student housing. That’s where shots were fired from semi-automatic weapons, wounding Currington and a second unidentified student-athlete. Singleton allegedly returned fire, also with a semi-automatic gun, striking no one, after which all parties fled. District Attorney Scott Perrilloux did not respond to a request by The Associated Press to be interviewed about the case. His spokeswoman, Autumn Payton, said there were no attorneys of record yet for Singleton or the two others arrested — Herbert Joseph Jr. and Jacoby Senegal. The Lions played their last three games without the 6-foot-7 Currington, whose primary role had been to defend opponents’ top post players. Brandon Gonzalez, a 6-6 redshirt freshman, has seen his minutes double in Currington’s absence. Singleton was a top reserve. He was not arrested until several days after the shooting and even played in one game — a victory at Northwestern State on Feb. 24 — before his arrest. Southeastern has not explained why Singleton was allowed to play in that game. University executive director for public and government affairs Erin Cowser said federal law prohibits university officials from publicly discussing student discipline. Earlier this week, Ladner brought in a Billy Reid, a former NBA player-turned-federal marshal in Mississippi, to address the team. Reid told the players they are not “bigger than life” just because they are athletes. “You lose perspective on what might happen to you,” said Reid, who played one season for the Golden State Warriors (1980-81) and several seasons overseas after his collegiate career at San Francisco. “They thought they were bigger than life and then they’re in a situation with regular guys who have guns and start shooting at them. Veal and fellow guard Josh Filmore said the team stands by Currington and Singleton, and will want them to share, in some way, in whatever success the Lions continue to have. This story has been corrected to show that the last name of Southeastern’s executive director for public and government affairs is Erin Cowser, not Cowsel.